What Else Can I Expect from an Online Associate in Public Safety Administration program? What Can I Do With an Associate in Public Safety Administration Degree? Public safety administration jobs run the gamut, ranging from police officers to EMS or emergency responders. It can be a thrilling way to serve your community. Public service jobs are in demand, particularly in the EMT field. The Bureau of Labor Statistics projects a growth rate of 24%, which translates to 58,500 new EMT jobs over the next ten years. In order to obtain a thrilling career as an EMT or other public safety position, a degree in public safety administration is required. Earning a public safety administration degree online is the fastest, most cost-effective way to earn it. Students who can’t make it to Polk State’s Winter Haven, Florida campus can still pursue one of the college’s academically rigorous, career-focused degree programs. Polk State offers numerous web-based associate and bachelor’s degrees, including an associate in science in criminal justice technology. Focusing on criminal law, criminal justice ethics, and correctional practices, this 60-credit public safety administration degree introduces the fundamental skills and concepts needed to take on entry-level positions in the criminal justice field. In addition to general education and major coursework, degree candidates complete one elective and two specialized courses in communications and political science. Elective course options include crime scene investigation, probation and parole, and an internship. Prospective students must submit official high school transcripts which demonstrate a GPA of 2.0 or higher, and some applicants may be required to take a placement test. While the college accepts transfer credits from other institutions, learners must complete 25% of their degree through Polk State. Located in Fort Lauderdale, Keiser University offers more than 100 degree and certificate programs, including an associate of arts in criminal justice. Consisting of 60 credit hours, the program presents a broad survey of the American criminal justice system, building competency through robust coursework and hands-on activities. Students pursuing a public safety administration degree online explore topics and procedures in criminology, criminal investigations, law enforcement, and corrections. Students must also complete 36 credit hours of general education coursework in English, science, math, and behavioral science. Prospective students should provide a copy of their high school diploma or GED. Keiser University accepts credits transferred from regionally accredited institutions, provided that students complete the final 25% of their degree through the university. Keiser is also a Yellow Ribbon institution, and veterans, military personnel, and their dependents receive tuition assistance, special scholarship opportunities, and unlimited access to Tutor.com. Boasting a total student body of 66,000 individuals, the University of Central Florida is the nation’s largest public university in terms of enrollment. UCF’s associate of arts in criminal justice program is open to students who have previously completed another AA degree from a Florida state or community college, or those who meet the university’s general education and foreign language stipulations. UCF’s public safety administration degree takes an interdisciplinary approach to criminal justice, and core coursework examines current issues relating to the criminal justice system and crime in the U.S., as well as data analysis and research methods. Learners have the opportunity to contextualize their public safety administration degree in a real world environment by completing an internship. Applicants may transfer up to 12 hours of relevant criminal justice coursework from another school. Once accepted, students must complete a series of online orientation sessions before enrolling in classes. Offering more than 20 web-based and hybrid AA programs, this Pennsylvania college is a regional leader in distance education. Its 62-credit associate of arts in criminal justice provides learners with a solid foundation in basic law enforcement and criminal justice concepts, as well as associated legal and ethical issues. While many graduates transfer to a four-year bachelor’s program, others find that, with a public safety administration degree jobs in the field are more accessible. After completing general education coursework, students examine relevant sociological and psychological principles, as well as topics in criminology, corrections, and police administration. Courses are presented through the Blackboard platform, streaming live lectures, and a combination of the two formats. Newly-admitted students must complete a placement assessment exam, which includes a review of high school transcripts or GED scores, any previously earned college credits, and standardized test scores. This assessment is followed by an educational planning session, in which learners receive personalized academic advising. Established in 1879, Georgia Military College is one of only four military junior colleges in the country. Serving cadets and civilians alike, GMC offers a range of traditional and online programs, including a public safety administration degree that leads to an AA, AS, or AAS in criminal justice. All three online programs provide an overview of major theories and practices utilized in corrections, criminal investigation, and law enforcement. Consisting of 73 quarter hours, the AA curriculum examines criminology and criminal procedures from a liberal arts standpoint. While major coursework for the 69-credit AS and 43-credit AAS degrees explores similar themes, these programs emphasize math, science, and technology. Graduates are prepared to assume entry-level positions in law enforcement, administration, and emergency services, or transfer to a four-year criminal justice program. Prospective distance learners must submit official transcripts or proof of GED. While SAT and ACT scores are not required for admission, individuals who provide adequate scores may bypass GMC’s mandatory placement tests. Clarion University of Pennsylvania’s public safety administration degree can be completed entirely online. The school’s Department of Justice, Law, Technology, and Liberal Arts offers the degree, which is an associate of science in criminal justice. The program gives students a broad overview of the field and covers all major areas of criminal justice, including corrections, policing, criminology, juvenile justice, and law adjudication. Upon graduation, students are qualified for entry-level positions in the criminal justice field. Credit requirements for the AS in criminal justice include 33 criminal justice credits out of a total 60 credits needed to graduate. Criminal justice courses offered by the school include probation and parole, substantive criminal justice law, and a criminal justice co-op. Clarion provides a real-time online orientation session for all online students at the beginning of every semester. Daytona State College’s associate of science in criminal justice technology bridge program is ideal for law enforcement professionals who are seeking a flexible public safety administration degree program. Open to students who have passed Florida’s Officer Certification Examination and have attended or plan to attend the Correctional Officer or Law Enforcement Recruit Training Academy, the 60-credit program takes approximately one year to complete. Building on learners’ prior knowledge, major courses address topics in organized crime, criminal investigation, and forensic science, while introducing administrative practices unique to police supervision. Students must also complete 15 hours of general education coursework, including a required oral communication course offered exclusively on campus. All other courses are presented entirely online, and are six or seven weeks long. Candidates may transfer up to 24 vocational credits from academy training toward their degree. The program is eligible for both federal and state financial aid, and qualifies for state salary incentives. Based in Dobson, North Carolina, Surry Community College offers a web-based AAS in criminal justice technology that examines law enforcement and judicial processes at the local, state, and federal levels. Graduates often take on entry-level public safety administration degree jobs, including correctional officer, loss prevention specialist, and county detention officer. Emphasizing law enforcement operations and investigative procedures, the 68-credit curriculum explores the role of criminal justice in the community and society at large. Major-specific courses examine contemporary issues and debates relating to ethics, race relations, and substance abuse, as well as criminal law and court procedures. Students also complete relevant general education classes, such as government, technology, psychology, and communications. Learners who have passed an accredited basic law enforcement training course and subsequent certification exam after 1985 may receive credit toward their degree. Prospective students should provide high school, GED, and/or military transcripts along with their application. This Florida university offers numerous professional development opportunities to students who earn an associate of arts in criminal justice. Field placements with local police academies, branches of the U.S. Drug Enforcement Administration, and the Secret Service provide valuable working experience that can open doors to a range of public safety administration degree jobs. In addition to fieldwork, many classes in the program incorporate hands-on learning modules, which expose students to forensics labs and courtrooms. The 60-credit curriculum is divided between general education courses and major-specific classes. Major coursework introduces the fundamentals of crime scene investigation, homeland defense, and criminal procedure; providing a solid basis in criminal justice theory and practice. Students may fulfill the program’s general requirements with an array of unique course offerings, including Native American history, love and desire in literature, and science in science fiction. All courses are presented asynchronously, and learners may attend virtual office hours via chat sessions. Applicants must submit proof of high school graduation or GED completion, as well as any relevant standardized test scores or certifications earned. Seminole State College of Florida’s associate of arts in criminal justice is intended for students who wish to transfer to a four-year Florida institution after graduation. This 60-credit public safety administration degree incorporates general educational and major specific requirements into a program equivalent to freshman and sophomore coursework at a four-year university. Seminole State guarantees program graduates admission to one of Florida’s 12 state universities. Along with 27 credits of major requirements and 18 general credits, degree candidates can tailor the curriculum to their personal goals and interests through elective coursework. Covering specialized topics in homeland security, gang and homicide investigations, and law enforcement leadership, electives provide an introduction to area-specific studies. Prospective students should provide official transcripts and a residency affidavit with their application. While all students complete a mandatory virtual orientation session, transfer students must schedule an additional advising appointment following acceptance. Founded in 1925, San Antonio College is the oldest public two-year college in Texas. Individuals who wish to pursue public safety administration degree jobs can choose between the college’s two 60-credit AAS in criminal justice programs, which focus on correctional science or law enforcement, respectively. Correctional science AAS candidates explore the legal and practical aspects of corrections, criminalistics, and the juvenile justice system. While law enforcement courses address similar concepts, the curriculum places special emphasis on sociology, police science, and community engagement. Both curricula include a required introductory criminal justice course and two semesters of composition. San Antonio College maintains an open door admissions policy, and prospective students do not need to submit standardized test scores; however, newly-enrolled learners may need to complete a series of prior learning assessment tests. San Antonio College is accredited by the Southern Association of Colleges and Schools Commission on Colleges, and participates in the Texas Public Educational Grants program. Integrating concepts in communication and behavioral science, this Wisconsin university offers a career-focused, 64-credit associate of science in criminal justice that provides an introduction to key skills and concepts in the field. Required major courses in criminology, court and legal procedure, and corrections are supplemented with broad surveys of psychology, ethics, and sociology. Most courses are presented asynchronously, without set meeting times, although a few include live streaming lectures. Distance learners interact with faculty and classmates through discussion boards and forums. Students must maintain a minimum 2.0 GPA in order to graduate. 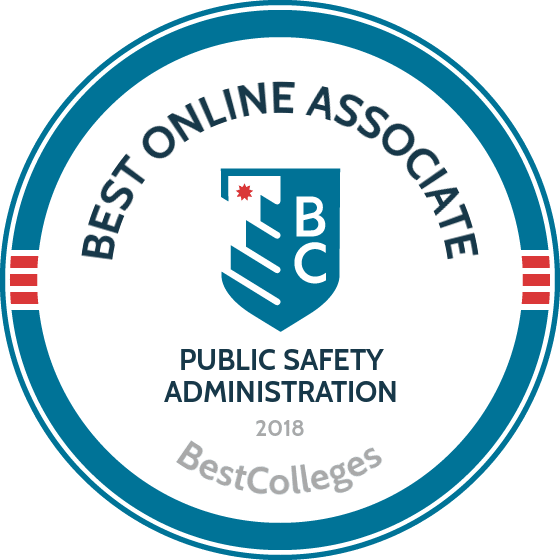 All credits earned through public safety administration degree online coursework may be counted towards one of Maranatha’s bachelor’s programs. The university permits credit transfer from other accredited institutions, but maintains the right to deny credit if they deem any course content or underlying philosophy to be out of line with their institutional values and learning objectives. Located in Clearwater, Florida, St. Petersburg College is known for making higher education accessible to busy professionals. SPC offers more than 650 online courses and 50 web-based degree programs, including an associate of science in criminal justice technology. This public safety administration degree gives learners the skills and expertise needed to pursue careers with law enforcement agencies, crime laboratories, and other legal and other areas of public service. Covering a diverse range of topics, including crime scene technology, internet fraud, crime scene safety, and critical infrastructure protection, the 60-credit curriculum exposes learners to a broad range of contemporary issues and concepts in criminal justice. Students may choose an elective subpath in either corrections or law enforcement, and can apply any credits earned at one of SPC’s training academies toward their degree. All program graduates automatically meet admission requirements for the university’s public safety administration BA program. An associate degree in criminal justice studies can be earned completely online at Peirce College. Areas of focus for criminal justice studies students at Peirce include: law enforcement, the correctional system, criminal investigation, introduction to private security, and juvenile justice. The program includes both a practical and theoretical study of criminal justice. Accelerated online courses start almost every month. Tuition is $578 per credit hour, which does not include other associated fees. The curriculum requirements for the criminal justice studies program include 61 credits, 33 of which are within the student’s chosen major. Course offerings focus on topics such as ethics in criminal justice, homeland security, computer crimes, and victimization. The program also offers students the opportunity to take part in a capstone course and a three credit cooperative work experience. Graduates of Peirce’s criminal justice studies program will qualify for many public safety administration degree jobs, from private investigator to police officer. Eastern Florida State College is known for its high graduation rates, military-friendly policies, and robust eLearning division. EFSC’s associate of science in criminal justice technology is a 60-credit public safety administration degree intended for learners interested in law enforcement careers, or current professionals seeking to increase their depth of knowledge in the field. Major and elective coursework spans a wide range of topics, including American criminal justice, crime scene investigations, terrorism, and state and local government. Students may also fulfill part of the elective requirement through a service learning field experience. Most full-time learners are able to complete the program in around two years. Prior to program admission, applicants must undergo a series of academic assessments, and, if necessary, complete developmental coursework. Students are required to attend a virtual orientation session before registering for courses. Individuals who pass the Florida Department of Law Enforcement Officer Competency Exam may receive credit towards their degree. Based in Montgomery, Alabama, Amridge University is a private institution affiliated with the Churches of Christ. An early leader in distance education, Amridge began offering web-based degrees in 1993. Students today can choose from more than 30 online programs, including an associate of arts in criminal justice. Consisting of 64 credits, this public safety administration degree provides half of the credits needed to earn a bachelor’s degree in the same subject. Major courses include seminars on domestic terrorism, hate crimes, the U.S. penal system, and public safety. The program’s 20-hour general education component supplements criminal justice coursework with introductory classes in psychology and ethics. All students must complete a 4-credit foundational course in management intervention. Amridge University offers distance learners a variety of career services, including resume assistance and personal advising. Students have access to the school’s employer database and resource library, which includes sample resumes and cover letters. This public community college specializes in providing flexible degree options in the realm of continuing and professional education. Whether a student intends to transfer to a four year college or take their knowledge into the workforce, South Texas College’s associate of arts in criminal justice offers a comprehensive introduction to the field. Students pursuing STC’s public safety administration degree online complete 60 hours of core and general education coursework, including courses in policing, criminal law, court procedures, and criminal investigation. While all learners must complete classes in algebra and statistics, most general courses focus on the social sciences and their relationship to criminal justice issues. All first-time college students must provide a copy of their high school diploma or GED scores upon application. While STC accepts transfer credits earned at accredited institutions, these are reviewed and awarded on a case-by-case basis. One-on-one virtual advising services are available. Emphasizing criminological theory, critical thinking, and ethics, Florida State College at Jacksonville’s associate in science in criminal justice technology places an applied focus on corrections, juvenile justice, victim services, and related occupations. Consisting of 60 credit hours, this accelerated program lets distance learners earn a criminal justice technology specialist certificate as they pursue a public safety administration degree online. In addition to professional courses such as criminal and constitutional law, juvenile delinquency, and policing, learners complete 15 hours of general education coursework and nine hours of electives. Some full-time students are able to complete the program in as little as 18 months. FSCJ is accredited by the Southern Association of Colleges and Schools Commission on Colleges, and its criminal justice program maintains industry associations with OSHA, the National Safety Council, and many other public safety organizations. Based in Springfield, Missouri, Drury University is a private liberal arts college known for its unique emphasis on experiential learning and public service. Students pursuing an associate of science in criminal justice are encouraged to apply their knowledge in optional hands-on learning opportunities facilitated by the university. The 62-credit AS curriculum explores the roots of criminality by examining the environmental, psychological, and biological factors that influence human behavior. Core coursework investigates topics in law and society, criminal justice ethics, victimology, and police patrol. Learners are required to complete one behavioral science course, focusing on either statistical or research methodologies. The 26-credit general education requirement includes two social science courses of the student’s choosing. Prospective public safety administration degree candidates should submit SAT and ACT scores and high school transcripts or GED scores. Drury offers several institutional scholarships, including exclusive opportunities for those enrolled in the College of Continuing and Professional Studies. Based in Albemarle, North Carolina, Stanly Community College’s associate of applied science in criminal justice technology explores the criminal justice system on federal, state, and local levels. Taking a multidisciplinary approach to criminal justice, the program examines theories and practices in criminology in light of legal studies, government, and communications. The 65-credit curriculum includes seminars on criminology, court procedure and evidence, and constitutional law. Special emphasis is placed on fundamental techniques utilized in criminal investigations and procedures. Along with major and general education coursework, degree candidates must complete one abnormal psychology class in either terrorism or forensic psychology. Elective courses include a work-based field learning option. Stanly Community College maintains an open door admissions policy, and applicants need only submit proof of a high school diploma or GED. Once enrolled, students must complete a placement test at the SCC campus or qualifying local institution. Located in Washington state, Centralia College is a two-year institution that focuses on the academic needs of working professionals. Centralia’s web-based associate of arts in criminal justice program can be tailored to meet the individual student’s professional or educational goals, whether graduates intend to pursue further education or a specific career path. Students earning their public safety administration degree online complete 63 credits of general educational coursework and 30 credits of major-specific classes, as well as a three to five-credit diversity requirement. Criminal justice courses are offered on a rotating cycle, and learners typically take one or two major classes each quarter. At the beginning of each term, all students meet remotely with an academic advisor to develop a course plan in line with their objectives. Centralia College is accredited by the Northwest Commission on Colleges and Universities. Its academic partnership with Saint Martin’s University allows graduates to easily transfer to Saint Martin’s traditional and online criminal justice completion programs. Fox Valley Technical College is a Wisconsin institution that offers customized employee, technical, and occupational training. The college’s associate of applied science in criminal justice provides a broad overview of emergency management, law enforcement, and corrections. Stressing critical thinking and applied skills, this 63-credit public safety administration degree develops competencies in forensic science, communication, criminal reporting, and crime prevention. While graduates go on to pursue roles ranging from DNR warden to public safety dispatcher, those seeking traditional law enforcement careers are granted priority seating at Wisconsin law enforcement academies. FVCC permits learners to transfer credits in and out of the program, and maintains transfer agreements with more than 65 two- and four-year colleges. Prospective students must pass an academic skills examination, unless they have previously earned a degree from a four-year college or achieved qualifying GED scores. A public safety administration degree, Mansfield University of Pennsylvania's associate of science in criminal justice administration degree can be earned entirely online. The program was designed to meet the needs of people already working in the criminal justice profession and other non-traditional students who might not have the time to attend in-person courses. Students who complete the AS can transfer into Mansfield’s bachelor’s in criminal justice program. The major requires 30 credit hours, including 18 core credits and 12 elective credits. To graduate, students must complete a total of 60 credit hours. Core required courses include survey of policing, survey of corrections, and other courses that provide a broad overview of the field of criminal justice. In elective courses, students are able to delve deeper into specific topics in which they are interested, including policy, criminal justice ethics, crime prevention, and serial murder. Founded in 1955, Chaminade University of Honolulu is a Catholic liberal arts school and Native Hawaiian-serving institution. The university’s associate of science in criminology and criminal justice features interactive learning exercises that instill crucial hands-on skills related to crime scene investigation and evidence processing. Consisting of 60 semester credit hours, Chaminade’s public safety administration degree curriculum emphasizes the complex social, psychological, and economic factors behind crime and criminal behavior. Along with foundational criminal justice and legal courses, learners complete one class in general supervision and management techniques. Guest instructors, including state and federal agents, occasionally present specialized modules on interviewing witnesses, evidence collection, and securing public crime scenes. All courses are ten weeks long, and presented in an accelerated format. Applicants should provide official high school transcripts, GED scores, or a joint services transcript. Chaminade is a member of the Servicemembers Opportunity College Degree Network, and offers discounted tuition rates and course credit for military service. Hawaii Pacific University’s associate degree in criminal justice is available entirely online through its Military Campus Program. The school's Military Campus/Off-Campus Program provides distance education to military members, families of military, veterans, and other non-traditional students. The program looks at criminal justice through an interdisciplinary lens, including behavioral sciences, law, and management. Course length varies by season: fall and spring courses last eight weeks, summer courses last seven weeks, and the winter term last four weeks. To graduate, students must complete 60 credit hours (including general education and major requirements). Subjects students at Hawaii Pacific examine include crime and criminals, laws and courts in world cultures, and social problems and policy. If desired, students in the school's AS in criminal justice program can proceed directly to Hawaii Pacific's bachelor’s in criminal studies program. The school's public safety administration degree online requires students to complete at least 15 credits in residence. A public safety administration degree can open a lot of doors. Public safety administration jobs include police officers and firefighters. Employees in public safety administration must work flexible hours; you never know when a fire, crime, or emergency might happen. Public safety administrators must cope with stress and perform under deadlines. Police Officer: Police officers protect property and lives and enforce the law. They must deal with dangerous situations and wield the power granted to them with discretion. Many standout police officers eventually become detectives. Firefighter: Firefighters manage, control, and put out fires. They also deal with other dangerous situations that may damage lives, property, or nature. Emergency Management Director: Emergency management directors create plans and strategies for dealing with natural disasters and emergencies. When those natural disasters and emergencies happen, they coordinate and direct other public service officials in responding. After you complete your associate degree in public safety administration, you may want to continue your education and transfer to a bachelor's program. You should consider which specific path in public administration you'd like to follow. If you want to be a police officer or firefighter, you likely need academy training instead of more education. If you want to be an emergency management director or work in public health, you should pursue further education. Below are several bachelor's programs that can enhance your desirability to employers. Kaplan University -- BS in Public Administration and Policy: Kaplan University's program features a unique focus on policy. Students look at how policies are designed and evaluated and how they affect the public. Kaplan also offers an accelerated option that leads to a master's in public administration. Walden University -- BS in Political Science and Public Administration: Walden's curriculum contains courses in political science and civic engagement/social entrepreneurship courses, leaving graduates with multiple options in the job world. The program also boasts a contemporary focus, dealing with energy, human rights, and health care, among other topics. Bellevue University -- BS in Emergency Management: Bellevue University's program teaches students how to organize and prepare for natural and manmade disasters. The degree is offered online and on campus in a cohort format. The next table shows the top five paying states for public safety administrators, specifically police officers, the most common profession for a public safety administrator graduate. The top three states have major cities that require more public safety professionals -- California (Los Angeles and San Francisco), New York (New York City), and Illinois (Chicago). Public safety administration is a tight-knit field, and many of its professional organizations promote, advocate for, and encourage working with the public. A number of organizations also offer advancement opportunities such as professional development and networking events. The American Society for Public Administration (ASPA) overtly focuses on making connections through journals, local chapter meetings, advertising, awards programs, and conferences. International Public Safety Association: the IPSA represents the interests of public safety administrators across the field, including law enforcement, public works, public health, hospitals, security, and more. American Society for Public Administration: The ASPA's main purpose is to glorify the profession of public administration and service. The organization promotes the teaching of public administration as well as providing networking and professional development opportunities for those in the field. The International Association of Campus Law Enforcement Administrators (IACLEA): The IACLEA provides educational resources for workers in the public administration field. The organization also advocate for public administration and provide professional development opportunities. Students can fund their public safety administration degree through financial aid; the first step is to fill out a FAFSA form. You should apply to a number of the different scholarship programs available, from public and private institutions and organizations.